Welcome to part dos of my Mexican fiesta! 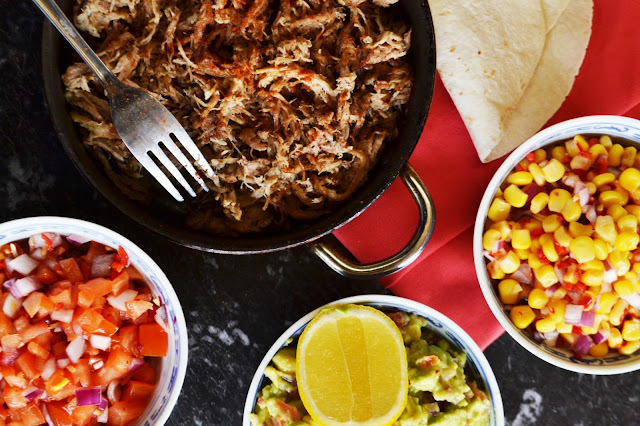 I made a huge batch of pulled pork which is a. delicious, b. so freaking easy to make it actually embarrassing and c. so versatile it can be the base of at least four different dishes! I made it quite basic in terms of flavour in keeping with the versatility theme but you can definitely jazz it up to suit your tastes. 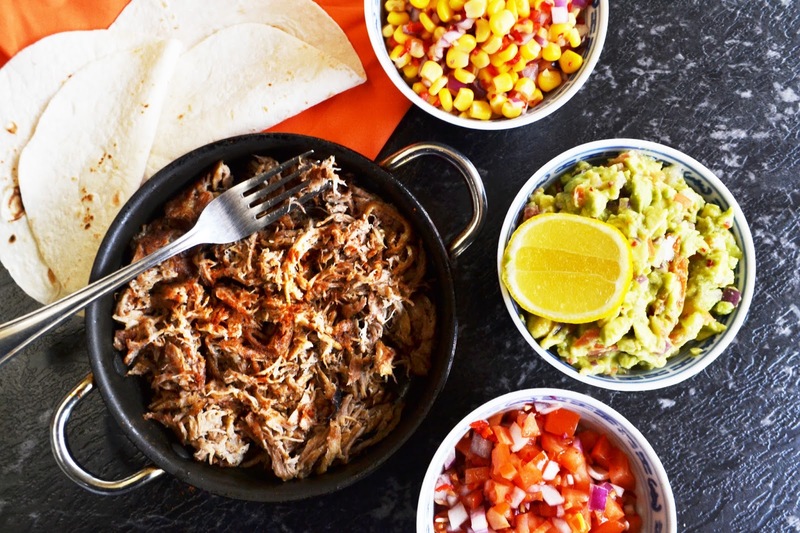 I turned my pulled pork into pseudo carnitas but heating it in a pan till bits of the pork turned all toasty and caramelised and the rest was meltingly tender. I then sprinkled over some cayenne to add a little heat and served it in warm flour tortillas with my trio of salsas and a little greek yoghurt. I make my pulled pork in a slow cooker so I literally just brown the meat on the stove, throw the rest of the ingredients in the pot and then walk away and do something more fun than checking the oven every 40 minutes to make sure nothing's burnt! 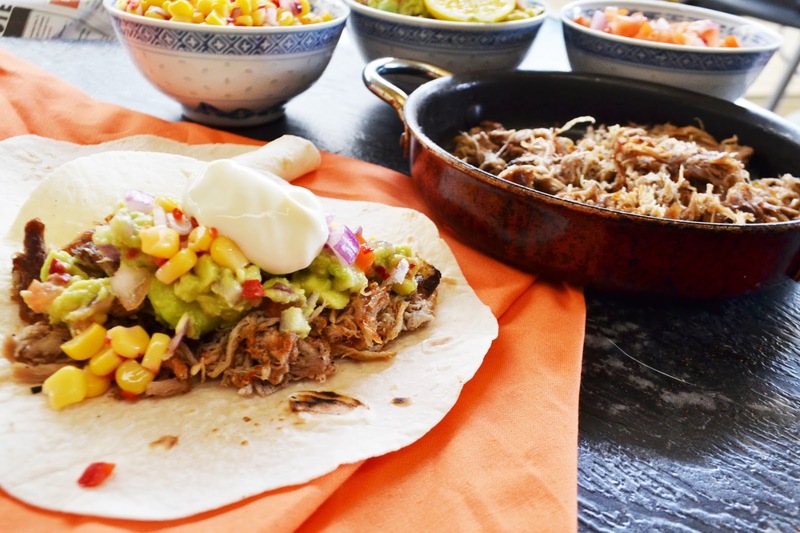 I do cook it in stock or water rather than in the more traditional fat (for carnitas) because while confited meat is off the wall delish; cooking with that much fat just freaks me out! I also use the pork in pulled pork sandwiches with coleslaw and homemade barbecue sauce which is so yummy it'll make your heart melt (or stop if you listen to your cardiologist). You can also use the meat in quesadillas, on pizzas, in chilli...the list goes on! 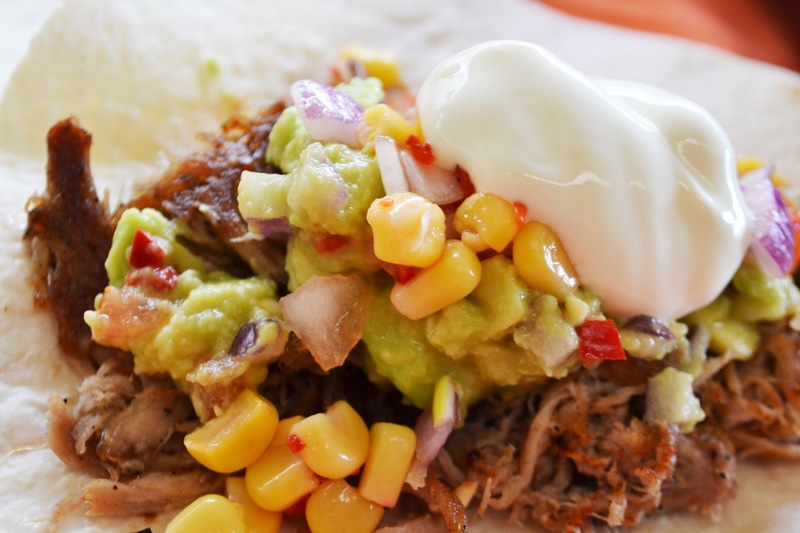 I used Greek yoghurt here instead of Mexican crema or sour cream just because it's a little lighter and with the pork being so rich, believe me when I say you really won't miss it! Read on for the recipe. Makes a very large pot; enough to serve 8 very hungry people... or 4 people with leftovers. You get the idea. 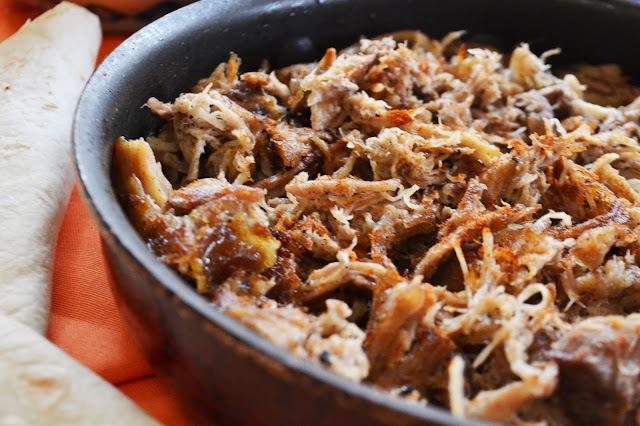 To make carnitas, simply heat a pan on medium then add in the pork and dry fry, stirring occasionally till parts of the pork crisp up. Otherwise, the cold pulled pork is very receptive to being nuked in the microwave. Mix together the spices along with the salt and pepper. Rub this mixture all over the pork, avoiding the skin. Heat the olive oil in your slow cooker pot at a medium-high heat on your stovetop (that is, if it's ok to go on the stove, otherwise a normal heavy based pot will do) and place the pork skin side down and allow the fat to render out for 5 - 10 minutes. Then brown the rest of the meat, taking care not to burn the spices on the outside. Get it to a nice toasty, dark brown colour. Then throw in your quartered onions, your liquid (I used water) and pop it in your slow cooker on high, cover and then find something to do for the next 6 or seven hours. Though about halfway through the cooking time you'll want to flip the meat over so the other side is submerged in the cooking liquid. The pork is done when the bones slide out of the meat with little to no resistance. At this point, you'll have A LOT of cooking liquid in the pot; remove the liquid, along with what remains of the onions and the rest of the bones, with a ladle (sieve it and save for future use in stews, soups etc). I also take out most of the skin/fat which should be just barely hanging on to the meat. 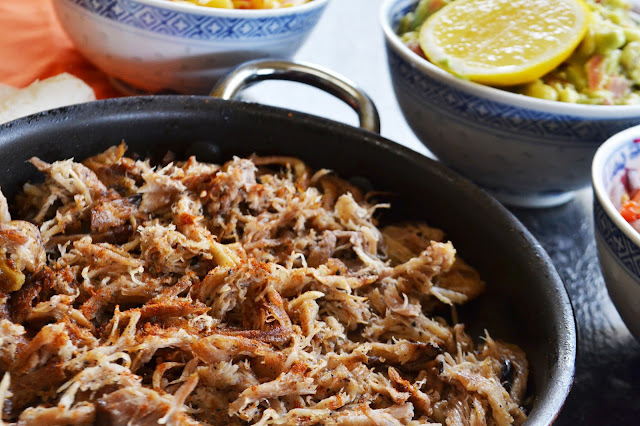 Using two forks or some tongs, pull the pork into tender shreds (I like mine chunky so I don't do this too finely) and season with salt and a little apple cider vinegar. Take these measurements with a grain of salt. Truth be told, I usually just wing it and don't normally measure out the quantities when I'm making this. Go with your gut and just adjust the seasonings (sugar, paprika, vinegar, molasses etc) to taste. That being said, you do want the sauce to be nice and tangy to compliment that awesome pulled pork. Saute the onion in the olive oil till it begins to brown. Add the paprika, brown sugar, tomato puree, molasses and vinegar. Simmer over a low heat for 5 - 10 min or until thickened slightly. Blitz with a stick blender (but good Lord, be careful because this stuff is HOT!) and then season to taste. Serve with pulled pork and coleslaw on soft rolls. Or baste some ribs with it. Or have it on your steak. Whatever man... it's all good! I can confirm that it was delicious :) Thanks so much!